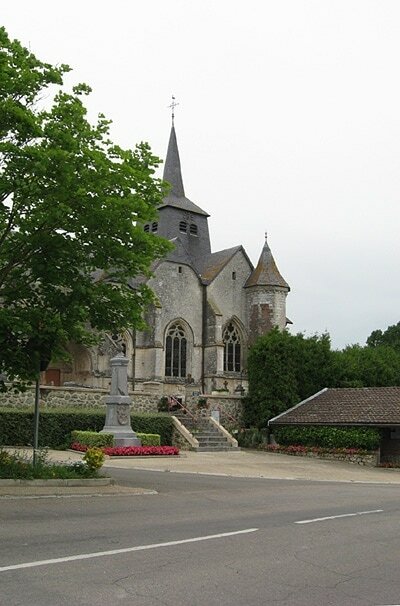 Dommartin-Lettrée is a village and commune some 22 kilometres south of Châlons en Champagne and some 22 kilometres west of Vitry-le-François. The church is to be found in a central position in the village, and the Commonwealth war graves of five airmen of the Royal Air Force and two of the Royal Canadian Air Force lie in the churchyard immediately behind the church. When Germany invaded France early in May 1940, the British Expeditionary Force had already been established there for some time. Between their dramatic evacuation a few weeks later and the Normandy landings of June 1944, Commonwealth forces activity in France was limited to coastal raids and special operations. 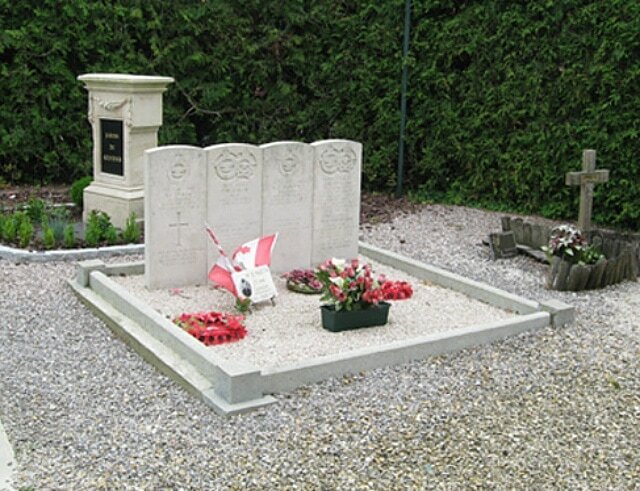 Most of the Second World War Commonwealth cemeteries are situated in the coastal areas of northern France, but graves will also be found in communal cemeteries and churchyards all over the country, many being those of Commonwealth airmen who failed to return from missions over northern Europe. Dommartin-Lettree Churchyard contains the graves of seven Commonwealth airmen of the Second World War. 54076 Pilot Officer Francis William Baker, Pilot in 460 (R. A. A. F.) Squadron, Royal Air Force, died 4th May 1944. 1823613 Sergeant Harry Penrice Black, Air Gunner in 460 (R. A. A. F.) Squadron, Royal Air Force Volunteer Reserve, died 4th May 1944, aged 19. Son of Harry Leadbetter and Mary Alexander Penrice Black of Edinburgh. INSCRIPTION. YEARS SHALL NOT DARKEN NOR SHADOWS DIM BEAUTIFUL MEMORIES WE HAVE OF HIM. 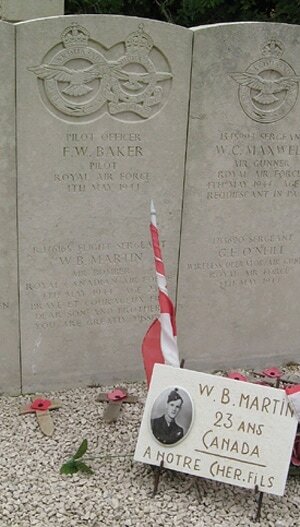 R/176165 Flight Sergeant Wilfred Bernard Martin, Air Bomber in 460 (R. A. A. F.) Squadron, Royal Canadian Air Force, died 4th May 1944, aged 23. Son of Thomas and Marie-Thérèse Martin of Daylesford, Saskatchewan, Canada. INSCRIPTION. BRAVE ET COURAGEUX FILS. DEAR SON AND BROTHER YOU ARE GREATLY MISSED. 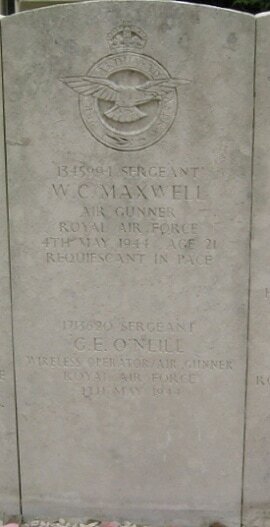 1345994Sergeant William Cochrane Maxwell, Air Gunner in 460 (R. A. A. F.) Squadron, Royal Air Force Volunteer Reserve, died 4th May 1944, aged 21. Son of William Cochrane and Mary Andrew Maxwell of Glasgow. INSCRIPTION. REQUIESCANT IN PACE. 1713620 Sergeant George Edward O'Neill, Wireless Operator in 460 (R. A. A. F.) Squadron, Royal Air Force Volunteer Reserve, died 4th May 1944. 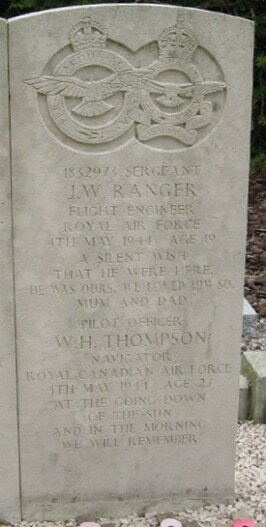 1832973 Sergeant James William Ranger, Flight Engineer in 460 (R. A. A. F.) Squadron, Royal Air Force Volunteer Reserve, died 4th May 1944, aged 19. Son of George Palmer and Ellen Edith Ranger of Bethnal Green, London. INSCRIPTION. A SILENT WISH THAT HE WERE HERE, HE WAS OURS, WE LOVED HIM SO. MUM AND DAD. J/88089 Pilot Officer Willis Henry Thompson, Navigator in 460 (R. A. A. F. ) Squadron, Royal Canadian Air Force, died 4th May 1944, aged 27. Son of John Henry and Marie J. Thompson of Windsor, Ontario, Canada. INSCRIPTION. AT THE GOING DOWN OF THE SUN AND IN THE MORNING WE WILL REMEMBER.